The popular view is that China is abandoning Marxist-Leninism and will slowly evolve into a capitalist and democratic state. Much of our relationship with China is based on this "Pollyanna" like view. below are excerpts from a 6th of February 2006 article in the Korean online journal Ohmy News "China Revives Marx"
According to the Xinhua News Agency, President Hu visited farmers in villages and expressed his New Year's greetings to them. He also visited historical sites of the Chinese revolution in Yan'an, including the former residence of Mao Zedong, Zhou Enlai, Zhu De, Liu Shaoqi, and Lin Biao. Yan'an is a holy site of the Chinese socialist revolution led by Mao Zedong. Being blockaded by Nationalist forces, the Red Army began its retreat - the "Long March" of 9,600km (6,000 miles), in 1934. After confronting all kinds of hardship, the army finally settled in Yan'an, where it could maintain its revolutionary authority, enabling it to declare the establishment of the People's Republic of China in 1949. Despite constitutional provisions the chief executive has the last say in political decision making in China, and therefore Mr. Hu's visit to Yan'an has important implications. For instance, the pioneer of China's reform and open-door policy, Deng Xiaoping, spent his New Year holidays in Shanghai - the symbolic city of reform and opening - for seven consecutive years after 1988. Today's China is a capitalist society in almost all respects except for the political governance of the Communist Party. It is commonly understood that China, ranked last year as the world's 5th largest economy, is really more capitalistic than any capitalist country, while outwardly claiming to be a socialist nation. Therefore, Marxism-Leninism, the dominant political philosophy in China for the thirty years since the establishment of the PRC in 1949, has practically been abolished. As can be gathered from his visit to Yan'an, the symbolic site of the Chinese socialist revolution, on New Year's Day, President Hu is at work on something that appears outdated at first glance: the Project on the Foundation and Establishment of Marxism. The Communist Party of China decided to launch the "Marx Project" in January 2004. 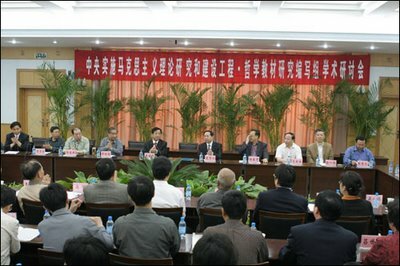 After convening preliminary conferences, the CPC officially established the Research Institute of Marxism under the Chinese Academy of Social Sciences on December 26, 2005, the birthday of Mao Zedong, thus expediting implementation of the Marx Project. The headquarters of the CPC exercises direct supervision of the Marx Project, and so the scope of the Project is tremendous. The Propaganda Department of the headquarters of the CPC is in charge of day-to-day affairs, and the Chinese Academy of Social Sciences, the CPC University, and the Defense University participate in the Project. According to the Nov. 2005 issue of the weekly Ryowang Dongfang, a magazine specializing in current political affairs in China, approximately 300 researchers are currently engaged in the Project, and about 20 conferences have already been convened. Just last year 20 million Yuan (U.S.$2.5 million) was invested in the Project. According to the South China Morning Post in Hong Kong, the Government of China plans to assign 3,000 man-days and invest between 100 and 200 million Yuan (U.S.$12.4 - 24.8 million). The Marx Project is designed to be a 10-year plan, and the Project results will be summarized and publicized every three years. The Director of the Research Institute for Marxism, Leninism, and Mao Zedong Thought at the Chinese Academy of Social Sciences, Li Chungfu, said that such a huge research project on Marxism is unprecedented in the history of the Communist Party of China. The first goal is to enhance research on Sino-Marxist theory, including Mao Zedong Thought and Deng Xiaoping Thought and on the "Three Represents" Theory. The "Three Represents" Theory was introduced in 2001 by Jiang Zemin, then president of China. According to this theory, the Communist Party of China must stand for the requirements of the development of China's advanced productive forces; the orientation of the development of China's advanced culture; and the fundamental interests of the overwhelming majority of the people in China. The second goal is to accomplish a new translation of the works of Marx and Lenin. Based on the internationally recognized Marx-Engels Collected Works, the Project is aiming at publishing the ten volumes of the Marx-Engels Collection and the five volumes of the Lenin Selection by 2007. The third goal is to update Marxism for academia. The fourth goal is to publish 13 volumes of textbooks for high school students; four volumes of general textbooks; three volumes of introductory theory; and six volumes of core texts. These textbooks will be first reviewed by an advisory committee and finally inspected by the Standing Committee of the Political Bureau of the CPC, which consists of elite groups in China. This process clearly shows the great interest of government leaders in the Marx Project. After publishing the first thirteen texts, publication will be expanded to 140-150 volumes. The fifth goal is to promote the ability to understand and the curricula for Marxist studies, targeting young theorists, scholars, reporters, and editors. The Vice Secretary-General of the Translation and Editing Bureau of China, Yang Jinhai, explained that the prime goals of this Project are research into basic Marxist theory, the compilation of high school textbooks, and the practice of Marxism in the real world. The Director of the Research Institute, Li Chungfu, said that traditional Marxism-Leninism is not opposed to either Deng Xiaoping Thought or the "Three Represents" Theory. He stressed, "People should recognize that traditional Marxism-Leninism is a basis of Deng Xiaoping Thought." Chung Infu, a professor at the Shanghai University of Finance and Economics, challenged the assertion that Marxism is outdated and said that he was confident in using Marxism in responding to all current problems. The Marx Project, however, reveals the expectations of the Western world as an illusory view of Chinese political developments. Helen Clark Out of Place in Valparaiso? More Christians in Our Prisons! Who Runs NZAID's "Global Group"?